Bulletproof coffee has taken the paleo world by storm. Not me, though. Don’t get me wrong. I’m all for people dropping grass-fed butter and coconut/MCT oil into their high-quality coffee, blending it all up into a high-octane mug of frothiness, but I just can’t get into it. If we’re talking coffee additives, I prefer my butter in the form of cream. That’s me. I definitely see the appeal of it, though, and I’m sold on the merits of the drink and its components. It’s just not for me. However, the idea of adding non-traditional fatty food items to coffee intrigued me, so I decided to explore other options. Eventually, I landed on eggs. Why eggs? Egg yolks are excellent emulsifiers. There’s the egg yolk lecithin, a famous emulsifier, plus several different egg yolk proteins with emulsification properties. Good yolks are prized by top chefs around the world primarily for their emulsifying ability. Egg yolks smooth out sauces, salad dressings, and relations between bitter enemies like oil and water. That’s right: egg yolks are the great unifiers of the food world. Throw some olive oil, lemon juice, salt, and pepper into a bowl, whisk it all together, and you’ll have a lovely stratified bowl of fluids of different shades. Oh, they might appear to blend together into a dressing for a second or two, but once you look away, the old immutable divisions will rear their heads and the dressing will disappear. Add an egg yolk or two, though? You’ll get a silky smooth salad dressing that remains so for time immemorial. If you don’t have a blender but still want a smooth, creamy coffee drink, hand-frothing an egg yolk with a fork or whisk will get you there. Hand-frothing butter and coconut oil requires vigorous labor and may not even achieve full emulsification. Eggs are incredible sources of micronutrients. While I love grass-fed butter, cream, and coconut oil, they aren’t exactly micronutrient-dense. The best butter contains beneficial nutrients like vitamin A, omega-3s, vitamin K2, and butyric acid, while coconut oil is a unique source of medium chain triglycerides, but for the most part we eat those foods because they are sources of stable, healthful saturated fats. They provide energy. Egg yolks, on the other hand, are baby bird building blocks. They contain everything you need to build an entire working animal from scratch – all the vitamins, minerals, protein, and fatty acids that make life work. And, if you get a pastured egg – which you should if you know what’s good for (and your omelets) – your yolk will be supercharged, with extra choline, vitamin E, vitamin A, vitamin K2, omega-3 fats, vitamin D, and beta-carotene from all the bugs and greens the chickens ate. I love eggs, particularly the yolks, and enjoy adding them to everything. They’re a solid, dependable, go-to breakfast item, they’re good for you, and they taste great. What more can you want? 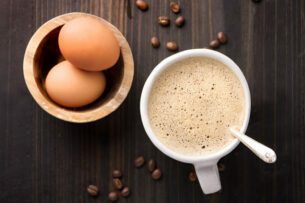 That’s why they ended up on my list of foods I couldn’t … Continue reading Primal Egg Coffee: The Best Part of Waking Up?